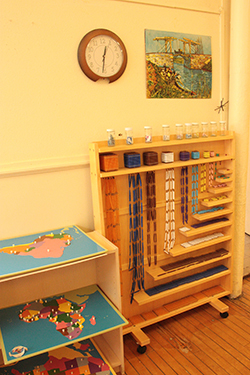 The Montessori School of Elora was established in 2002 by Association Montessori Internationale (AMI)-trained teachers. The school, located in the historic Elora Centre for the Arts building on Melville Street, offers both primary and elementary programs. The primary program, for children 3½ to 6 years old, is available as full or half days. The elementary program, for grades 1 through 6, is full days only. The Montessori School of Elora is dedicated to maintaining AMI standards and providing a high-quality Montessori education. Our goal is to help children reach their full potential in all areas of study in an environment that enables them to develop at their own pace and according to their own abilities. We believe that school should be a positive experience, where children gain confidence, become independent learners and, above all, find joy in learning. We are now accepting applications for children 3.5 to 12 years old. Montessori School students will see their work published. The Montessori School of Elora announced that six of its students who entered short stories in the annual Polar Expressions Publishing contest have successfully made it through the first round of judging and will see their work published later this year.